The Erechtheion is located on the northern side of the acropolis. In its current form it was constructed during the “Golden Age” of Athens — the fifth century B.C. It was completed in 406 B.C. and repaired many times. 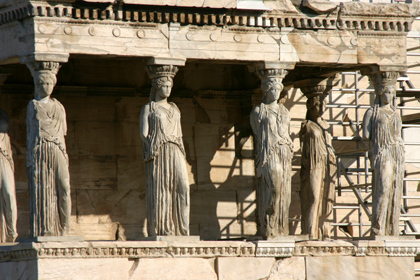 The Erechtheion (Erchtheon) is actually a complex structure composed of two temples, a north porch, a south (Caryatid) porch, and a sacred enclosure on the west. At least 10 different gods, goddess, heroes, and heroines were accommodated within the enclosure. It was named after one of the early kings of Athens, Erechtheos and the tomb of Cecrops was included in the sacred enclosure (Pandroseum). Athena, Poseidon and Erechtheus all had their own cult rooms.